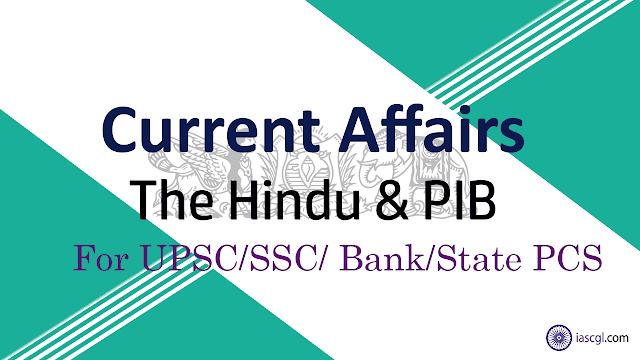 23-30th October 2018, Current Affairs and News Analysis for UPSC Civil Service Examination, SSC CGL and State Civil Service Examinations. ‘Real Difference comes about through Convergence’ as it alone simultaneously addresses multi dimensions of poverty. Professionals, Institutions and Enterprises make it possible. Evidence of convergence reducing poverty, raising incomes – IRMA Study. ‘Communitization’ through Women SHGs improves education, health, nutrition indicators. Leveraging Bank loans promotes an enterprise model. Many initiatives provide for universal coverage of the eligible beneficiaries – Ujwala, SBM, PMAY, Skills, Power, Roads, internet, Bank accounts. Integral positive co-relation among infrastructure, human development and sustainable economic well-being. 5000 islands of successful Rural Clusters over 1000 days will be transformational. News: Large number of tourists who could reach Mullayyana Giri and Seethalayyana Giri hoping to catch a glimpse of the ﬂowers returned disappointed. Neelakurinji ﬂowers, a shrub belonging to the genus Strobilanthes, blossom once in 12 years. Amur falcon is a small raptor of the falcon family. It breeds in south-eastern Siberia and Northern China before migrating in large flocks across India and over the Arabian Sea to winter in Southern Africa. The raptor (bird of prey) — the size of a pigeon — makes its home in Nagaland, flying a staggering 22,000 km from there to South Africa, then onto Mongolia and back to Nagaland. The bird has one of the longest and most fascinating migratory paths in the avian world. The falcon breeds in south-eastern Siberia and north-eastern China, where the Amur River divides the Russian Far East and China. It is a small raptor, of the size of a pigeon. It covers one of the largest migratory distances from Mongolia and Russia to South Africa. It is not a critically endangered species and is found in large numbers. However, due to indiscriminate killing, their numbers are rapidly coming down. It is considered as a delicacy in Nagaland and widely hunted and sold in the local market. The Centre decided to develop Doyang Lake in Nagaland, famous as a roosting site for longest travelling raptors Amur Falcons, as an eco-tourism spot for bird-watchers. An exponential increase in the number of pilgrims coming to the Ganga Sagar Mela, which takes place at the Sagar Island every year during Makar Sankranti, has been responsible for the worsening water pollution, prompting scientists to raise serious concerns about the likely outbreak of several diseases. The number of pilgrims descending on the Sagar Island to take a dip at the place where the Ganga meets the Bay of Bengal, has risen from 2 lakh in 1990 to 20 lakh in 2018. It is found that diseases like cholera, dysentery, and skin disease were predominant in the post­Ganga Sagar Mela period. It was noted that the focus of the administration is mostly on managing the mela, and that it should also manage the pollution with sustainable strategies. Several studies have shown that the island is at the frontline of climate change, facing serious erosion due to rising sea level and tidal surges. Sagar island is an island in the Ganges delta, lying on the continental shelf of Bay of Bengal about 100 km (54 nautical miles) south of Kolkata. Although Sagar island is a part of Sunderban Administration, it does not have any tiger habitation or mangrove forests or small river tributaries as is characteristic of the overall sunderban delta. This island, also known as Gangasagar or Sagardwip, is a place of Hindu pilgrimage. While urban Uttar Pradesh has 80% coverage of toilets, ineﬃcient sanitation systems ensure that almost 87% of the excreta being generated by these toilets is being dumped in water bodies or agricultural lands, according to a new analysis of 30 cities by the Centre for Science and Environment. With 2019 just round the corner, the number of toilets and onsite sanitation systems being built in the State are all set to increase exponentially — if not managed scientiﬁcally and sustainably, the amount of faecal sludge that these new toilets will generate will swamp the State. The report argues that building more toilets will only worsen the environmental, sanitation and manual scavenging situation, unless sewerage connections increase from the current 28% of households in the 30 cities studied. Onsite sanitation systems — such as septic tanks or pit latrines — are far more prevalent, and are used by 47% of households. The Supreme Court banned the sale and registration of motor vehicles conforming to the emission standard Bharat Stage-IV in the entire country from April 1, 2020. The country will have to shift to the cleaner Bharat- VI fuel from April 1, 2020. Bharat Stage (BS) emission norms: are standards instituted by the government to regulate output of air pollutants from motor vehicles. The BS-IV norms have been enforced across the country since April 2017. In 2016, the Centre had announced that the country would skip the BS-V norms altogether and adopt BS-VI norms by 2020. The GoM to come up with a comprehensive plan within three months and devise ways to ensure its time-bound implementation. Group of Ministers (GoM) are ad hoc bodies or inter-Ministerial panel formed to give recommendations to the cabinet on certain emergent issues and critical problem areas. During the UPA regime (from past two decades), the institution of GoMs had become a viable and effective instrument of coordination among the ministries. Ministers heading the concerned ministries were inducted into the relevant GoMs and when the advice is crystallised they were disbanded. The system of GoMs was intended to operate as a single window clearance on crucial issues related to various ministries with the objective of expediting policy making and good governance. In fact, the Asia-Pacific region is expected to see the fastest growth at the rate of 4.8%, followed by Africa (4.6%) and west Asia (4.4%). The other south-east Asian countries predicted to grow rapidly include Indonesia, likely to be the fourth largest by 2030 from its current ranking of 10th largest aviation market. Thailand, too, is expected to enter the top 10 markets in 2030,edging out Italy, as per IATA statement. Eminent geneticist and agricultural scientist who transformed Indian agriculture through the ‘Green Revolution’ was born on 7th August 1925 at Kumbakonam, Tamil Nadu. Swaminathan’s father M K Sambasivan was a surgeon and a follower of Mahatma Gandhi. He took part in the Swadeshi movement and the temple entry movement in Tamil Nadu. This instilled the idea of service into Swaminathan’s mind at a young age. After matriculating from a local school in his native town, he took admission in a medical school. But, the Bengal famine of 1943, in which about 3 million people starved to death, changed his mind and made him take up agricultural research. After securing the PG, he cleared the UPSC exam and qualified for the IPS. He, however, chose to take up a UNESCO fellowship at the Wageningen Agricultural University in the Netherlands to continue his research on potato genetics. He then moved on to the Cambridge University School of Agriculture and earned a PhD in 1952. After this, he went to work as a researcher at the University of Wisconsin. However, he returned to India in 1954 to work here. He continued his research at the IARI. Between 1972 and 1979, he was the Director-General of the Indian Council of Agricultural Research (ICAR). While there, he formed the National Bureau of Plant, Animal, and Fish Genetic Resources of India. He also played a role in the transformation of the Forest Survey of India (FSI). In 1979, he was appointed the Principal Secretary of the Agriculture Ministry of the Indian government. From 1981 – 85, he was Independent Chairman of the Food and Agriculture Organisation (FAO). From 1984 – 90, he was the President of the IUCN (International Union for Conservation of Nature and Natural Resources). In a dramatic midnight action, the Union Government on October 23, 2018 removed CBI Director Alok Verma and Special Director Rakesh Asthana from their posts. While divesting Director Verma of his charge, the government and the Central Vigilance Commission (CVC) cited that Verma had not been cooperating with the CVC’s inquiry into allegations made by Asthana against him through a letter on August 24 to the Cabinet Secretary. Verma was appointed as CBI Director in 2016 for two years and his tenure ends in December 2018. The decision was announced by the Appointments Committee of the Cabinet (ACC). The decision came after the ongoing tussle between CBI Chief Alok Verma and Special Director Rakesh Asthana escalated over bribery allegations, hurled at each other. Senior IPS officer Alok Verma approached the Supreme Court on October 24, 2018 after his removal from the post of CBI Director by the Union government and the Central Vigilance Commission (CVC). He claimed that this overnight decision was in violation of Section 4B of the Delhi Special Police Establishment (DSPE) Act, 1946, which grants the CBI Director a secure term of two years. The Supreme Court will now need to examine the government and the Central Vigilance Commission move. The Appointments Committee also issued an order appointing M Nageshwar Rao, presently working as Joint Director at the CBI, as Director of the Central Bureau of Investigation (CBI). Rao will take over the duties and functions of CBI Director with immediate effect. Rao, a 1986 batch Odisha cadre officer, joined the CBI as Joint Director and was promoted as Additional Director in 2018 itself. Citizenship (Amendment) Bill, 2016: Assam is on boil! The Citizenship (Amendment) Bill, 2016 has been gaining momentum amid protests against the Bill by Krishak Mukti Sangram Samiti (KMSS), Asom Jatiyatabadi Yuba Chatra Parishad (AJYCP) and 44 other organizations in Assam. These organisations called for the 12-hour shutdown in Assam to protest against the Centre's proposal to pass the Citizenship (Amendment) Bill, 2016 in the Winter Session of Parliament. Moreover, Assam Government has refused to take part in the proposed rally of organisations from West Bengal in support of the Bill. Earlier on October 11, 2018, BJP President of West Bengal, Dilip Ghosh announced BJP Rath Yatras to be held in December 2018 to garner support for the Assam NRC and for the proposed Citizenship Amendment Bill. The Seoul Peace Prize Committee on October 24, 2018 conferred the 2018 Seoul Peace Prize on Prime Minister Narendra Modi for his contribution to world peace through his economic vision, ‘Modinomics’. With this, PM Modi became the 14th recipient of this coveted award. The committee assessed over a hundred candidates proposed by over 1300 nominators from around the world and decided to bestow the Prize on PM Modi, calling him 'the perfect candidate for the 2018 Seoul Peace Prize’. The nominating group consists of 300 Korean nationals and 800 internationals. Virat Kohli on October 24, 2018 became the fastest batsman to score 10,000 runs in one-day internationals, reaching the milestone in just 205 innings. With the feat, he surpassed the record held by Sachin Tendulkar, who had achieved the feat in 259 innings. Virat Kohli became the fifth Indian batsman and 13th overall to reach 10000 ODI runs.The other Indians in the elite 10K club include Tendulkar (18426), Sourav Ganguly (11221), Rahul Dravid (10768) and MS Dhoni (10123). Tendulkar was the first in history to breach the 10,000 mark in ODIs. He got there in 2001 against Australia in Indore.